Separation is full of uncertainty for most couples. It is important to remember that every family law matter is different and you shouldn’t compare your circumstances to another couple. 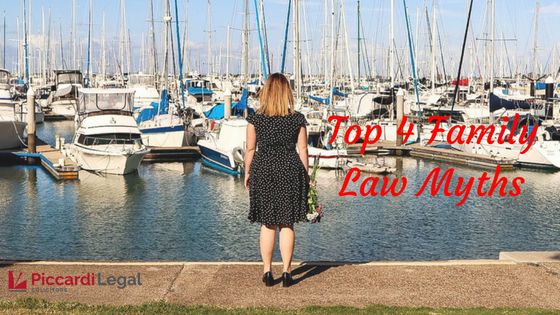 Today we are covering the top 4 myths in family law to try and clear up some uncertainty. This is perhaps the biggest myth in family law. There is no presumption that parties to a marriage or a relationship are entitled to an equal distribution of the property pool. Whether the parties had assets before the relationship started. Whether one or both parties made special contributions during the relationship, such as receiving an inheritance, gift of money or possibly a compensation payment. The length of the relationship (how assets are divided in a short relationship may be different from a long relationship). Whether there are children from the relationship. How much time the children might spend with their respective parents after separation. Whether the circumstances of the relationship has affected the income earning capacity of either of the parties. These are only some of the issues that are considered, but all of them combined are important factors that will assist in determining how the property pool is to be divided. Not all family law matters are required to go to court and court proceedings should only be commenced if absolutely necessary and as a last resort. There are now a range of methods available to help separating couples and their families reach a resolution for property settlement and parenting matters including collaborative law and mediation. Collaborative law and mediation are great ways to stay in control of the family law process, reduce costs and reach a satisfactory agreement. Most matters can reach a resolution by consent and an Application for Consent Orders filed in the Family Court. It is not necessary to have your divorce finalised before you do a property settlement. Parties can negotiate and formalise a property settlement at any stage after they separate and prior to being divorced. Divorce is the formal process of ending a marriage. Parties can not apply for a divorce until they have been separated for 12 months. Keep in mind, that once a certificate of divorce is granted by the Court, the parties will only have 12 months from the date the divorce is granted to formalise a property settlement. We recommend that parties formalise their property settlement before applying for a divorce to avoid time lapsing. When determining parenting matters the Courts paramount consideration is the best interests of the child. If equal time with both parents is not appropriate, then substantial and significant time will be considered. Whilst there is a presumption that parents should have equal shared parental responsibility for their children (which means the parents should jointly make decisions about significant issues for the children such as where they live, their health, schooling and religion) this does not mean that the children should necessarily spend equal time between their parents if it’s not in the childrens best interests, or if it is not practicable for that to occur. It is important to remember that no two cases are the same and the Courts have a very wide discretion to make decisions. It is therefore important to obtain independent legal advice about your particular circumstances. To arrange a consultation with our family lawyer, Megan Piccardi, contact our office on 07 3393 6489. This is general information only and you should take specific legal advice on your circumstances.